Born in the Magdelan Islands, Garnet worked at shoe repair, farming and as a woodsman. From 1978 until 1987 he served as custodian at Acadia University. Garnet began carving in 1978 following a knee operation. He carved small birds which he gave to his children and grandchildren. His work is now found in collections throughout Canada and the United States, including the Art Gallery of Nova Scotia. His carvings include alligators, life sized figures and spotted dogs. See a larger picture of the carving in the picture with Garnet by clicking here This carving is in the permanent collection of the Beaverbrook Art Gallery. 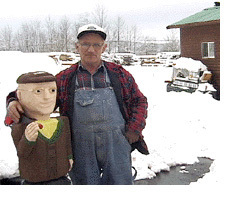 Garnet McPhail is also featured in the National Film Board of Canada documentary, "Folk Art Found Me".